A self-supported rooflight for applications in commercial and residential buildings. Building Regulations (E&W) Approved Document L compliant design to achieve low U-value targets. Non-fragility to ACR(M):001 Class B. 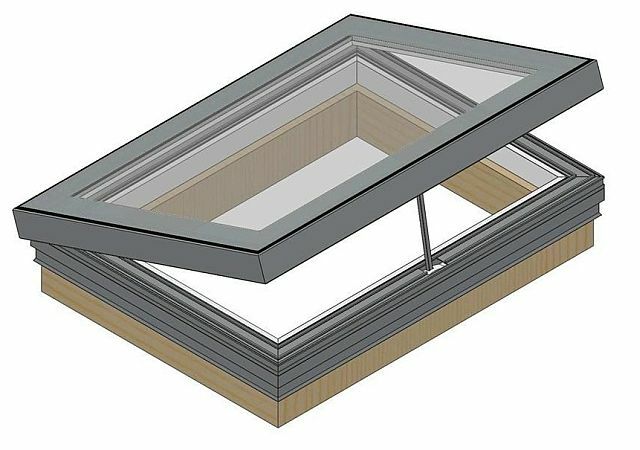 Natural Ventilation in accordance with Building Regulations (E&W) Approved Document F.
Designed to be installed to a weathered builders kerb, minimum 5° pitch. A PVC-U upstand is also available for standard size rooflights. Square and rectangular rooflights are available in one glass pane, to suit variable kerb sizes up to 3 m² total size. Double glazed units contained within a single frame to cater for a wide range of sizes. Concealed actuators give superior aesthetics. BS EN 1026: Air permeability. BS EN 1027: Water tightness test. BS EN 12211: Wind resistance test. Manufactured from extruded aluminium section to BS EN 12020-1. Recommended 150 mm high, minimum 75 mm wide. Double glazed total product U value 1.4 W/m²K. Electric operation rooflights: 1700 x 1700 mm or 3 m² maximum kerb dimensions. Manual operation rooflights 1700 x 1700 mm or 3 m² maximum kerb dimensions. Access hatch Rooflights 1500 x 1500 mm or 2.25 m² maximum kerb dimensions. A wide range of glazing options are available, please consult Roofglaze for exact details. Outer 6 mm toughened clear glass with sandblasted border. 16 mm cavity, argon filled, silicone bonded. Inner 6.8 mm laminated clear glass with soft coat low E coating (low E not required with Solar Control). Outer 4 or 6 mm toughened clear glass with sandblasted border. Inner 4 or 6 mm toughened clear glass with soft coat low E coating (low E not required with Solar Control). Body tint anti-sun: Pilkington Optifloat range. Self Cleaning / Easy Clean coating. Solar control: SGG COOL-LITE SKN solar control range. Access hatch operation with gas spring assist, handle and locks. Electric operation: Two actuators with synchronisation box are required where the length is greater than 1.5 m, otherwise one actuator is required. Manual operation: Two spindles with link rod required where the length is greater than 1.2 m, otherwise one spindle is required. The product information below is from the NBS Plus library of product clauses offered in NBS specification products. It has been created by NBS for Roofglaze Ltd. Each product clause is authored in NBS format and is intended for inclusion in project specifications. Please note that NBS product guidance is not a replacement for the manufacturer's literature and it is recommended that Roofglaze Ltd be consulted before specifying. Polyester powder coated RAL - Insert colour requirements, any RAL colour available. Standard colours are Grey RAL 7015, White RAL 9910, Black RAL 9005. If specifying Solar control additional requirement.